The formation of the first professional police force, the London Metropolitan Police, in 1829 led to a significant reduction in all measures of violent crime and a decrease in uncleared incidents of property crime. The later rollout of county police forces in England and Wales – between 1839 and 1856 – also reduced crime but only in counties that had built sufficiently large forces. These are among the findings of historical research on the impact of police on crime by Anna Bindler and Randi Hjalmarsson. Their study will be presented at the Royal Economic Society's annual conference at the University of Warwick in April 2019. Do police reduce crime? The general consensus reached by empirical researchers is: yes, more police manpower reduces crime. But this conclusion is largely based on research studying the expansion of well-established modern police forces. Much less is known about how the police-crime relationship changes with force size and experience. Does the first officer hired have the same effect on crime as the last officer hired? This study contributes to closing this knowledge gap by studying the effect of the first professional police forces worldwide, which were formed during the nineteenth century. Although situated in a historical setting, the study is still relevant to the modern context. First, recent reports indicate that budget cuts have led to the closure of local police stations, for example, in the UK and the United States. How will these closures affect crime? This depends on how the police-crime relationship varies with force size. Second, the results can be informative for countries where police forces have been disbanded and new ones created in an effort to fight corruption. To study the effect of the first professional police on crime, this study looks at two ‘natural experiments’ in history. Figure 1 shows the catchment area of the Met. Blue triangles represent ‘treated’ parishes in 1829, located within a seven-mile radius around Charing Cross (middle circle). The catchment area excluded the City of London and was expanded to 15 miles in 1839 (outer circle). The primary aim of the Met was to deter crime by being visibly present with officers slowly walking regular beats. 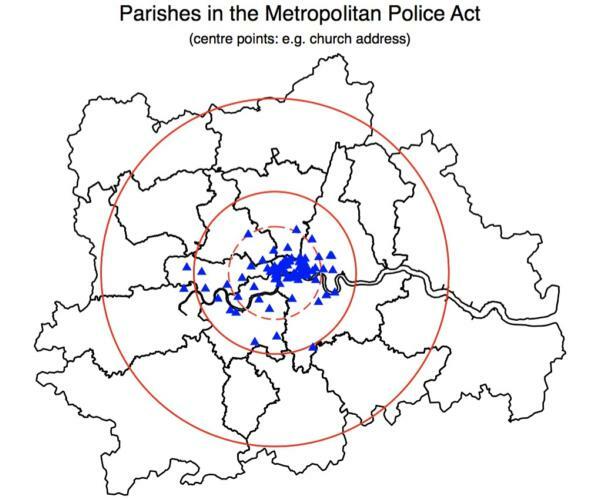 The exclusion of the City of London and the geographical boundaries allows for a comparison of changing crime rates in and outside the Met’s catchment area. As Figure 2 illustrates, 16 counties created forces soon after the County Police Act of 1839 made it optional, while 23 counties waited until forces became mandatory with an 1856 Act. To study the impact of these events, the authors work with three types of transcribed historical data. For the London analysis, they use geocoded trial data from the Old Bailey Proceedings Online and Daily Police Reports, including both charges and (uncleared) crime incident reports. For the counties, they created a dataset of the annual number of violent, property and other category trials in each county from yearly Judicial Statistics. Evidence of immediate implementation of reform in the ‘treated’ jurisdictions, based on changing trial references to ‘watchmen’ and ‘policemen’ before and after the reform, respectively. A significant reduction in all violent crime measures (both uncleared incidents and cleared charges/trials). For property crime, a decrease in uncleared crime incidents but an increase in cleared charges. Creating a sufficiently large force, relative to the population, reduced crime (trials) overall and across crime categories. This effect is not immediate and grows over time. No effect is seen for counties with insufficiently large forces. Why is there an increase in London property crime charges and no effect for relatively small county forces? Did the new police forces not deter these crimes? This is not necessarily the case: the authors measure the net effect of creating a police force, including (i) deterrence; (ii) an increased ability to catch criminals and clear crimes; and (iii) potential changes in crime reporting.